Join us on Tuesday, December 11 at 3pm ET for a roundtable discussion with Signum’s spring 2019 lecturers and preceptors. Join us on Tuesday, December 11 at 3pm ET for a roundtable discussion with Signum’s spring 2019 lecturers and preceptors, hosted by Signumite extraordinaire, Sparrow Alden. The panelists will discuss what to expect from this semester’s courses and who should sign up for them (everyone, of course! ), as well as plenty of delightful rabbit trails into pleasure reading of choice, favorite aspects of Signum, course wishlists, and more. The Life and Times of the English Epic – an exploration of the classical and late medieval origins of the English Epic through an array of more recent texts. Tolkien’s World of Middle-earth – a study of how Tolkien’s imagination evolved over time, and its effect on his scholarly work and fiction. 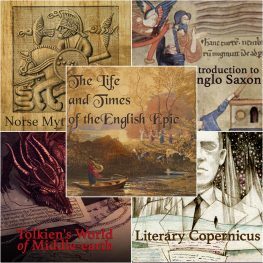 Norse Myths & Sagas – an examination of the roots of medieval Scandinavian literature and its meeting with the textual culture of medieval Christian Europe, which led to the development the prose sagas of Norse kings and Icelanders. Literary Copernicus: The Cosmic Fiction of H.P. Lovecraft – a look at Lovecraft’s complete body of work, as well as his predecessors, contemporaries, and successors. Introduction to Anglo-Saxon – a beginner’s study of the Old English language and literature, with a focus on the language as a gateway to the study of Germanic philology.